PROPOSED NEW CONSTRUCTION WITH HOMES BY PINNACLE! This luxurious home to be built with the highest of standards has 4 bedrooms / 3.2 baths and an office or 5th bedroom. Stone & stucco exterior, full masonry fireplace and amazing kitchen with marble & quartz, island with seating for 6, high-end stainless steel appliances and open floor plan for ease of entertaining! This 2.29 acre lot is surrounded by natural beauty - it's your own nature preserve! 20 upscale homes within the neighborhood and this lot is nestled in a quiet cul de sac. Gently sloping land will allow for a walkout lower level overlooking the vast natural setting for you to call home. 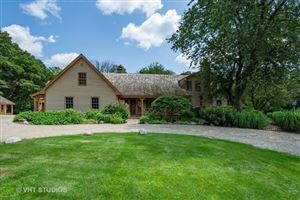 Nationally ranked Barrington school district; close to amenities! Make your dream a reality - proposed 4650 sq ft of stunning finished living space! All soil suitability reports are done and available upon request. See additional documents for detailed builder inclusions.